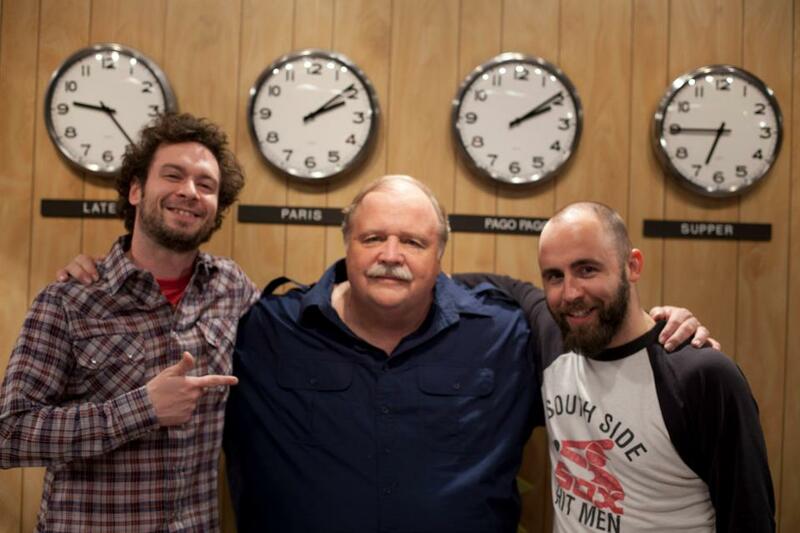 Steve Shields, Thomas Krettler and Alec Pinkston on the set of “Sick Day.” Courtesy of Sick Day. Morning news programs certainly provide fertile ground for satire. When anchors aren’t plugging their network’s latest reality TV sensation or gossiping about a recent celebrity break-up, they’re taking part in unseemly scripted laughter–the sort of hollow chortling that would befit robots rather than humans. It is this precise topic that Alec Pinkston and Steve Shields have caught in their crosshairs. They are the creators of “Sick Day,” an upcoming Chicago-based series designed to send up the mindless froth of “Good Morning America” and “The Today Show,” while managing to deliver the news a la “The Daily Show.” I had a blast chatting with Pinkston and Shields on this podcast, and am eagerly awaiting their first episode. Clips of the show, including its enticing teaser, can be found on the official “Sick Day” Facebook page. To view the “Sick Day” teaser, click here. For a first glimpse at sportscaster Fluff Richards (god, whatta name), click here.